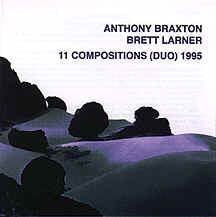 Anthony Braxton, flute, clarinet, contra-alto, contrabass adn soprano clarinets, sopranino, alto and F saxophones; Brett Larner, 13-string koto, 17-string bass koto. Composition 65 (04.57), Composition 74B (08.12), Composition 72H (02.46), Composition 74E (08.11), Composition 72A [take 2] (03.51), Composition 72F (06.07), Composition 74D + 72E (15.17), Composition 74A (05.27), Composition 72C (04.18), Composition 87 (15.31), Composition 72A [take 1] (03.42). Recorded on 24 March 1995 at Crowell Concert Hall, Wesleyan University.